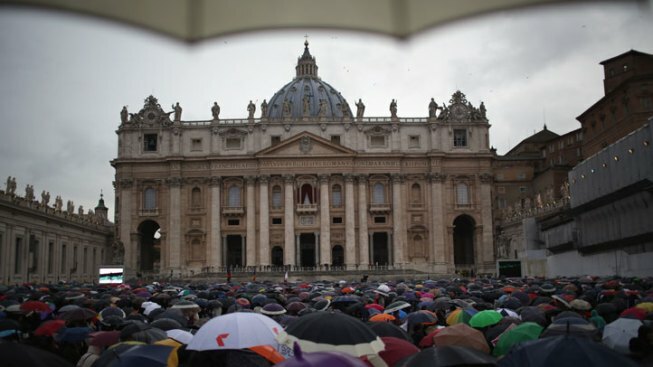 Faithful shelter from the rain under umbrellas as they gather in St. Peter's Square for news on the election of a new Pope on March 13, 2013 in Vatican City, Vatican. Argentinian Cardinal Jorge Mario Bergoglio was later elected as the 266th Pontiff and will lead the world's 1.2 billion Catholics. This first tweet, sent at 12:33 p.m. PT, roughly translates to, “We have Pope Francis.” Within three hours of its publishing, more than 63,000 users retweeted the post, which also got more than 16,000 favorites. The tweet from @Pontifex is one piece of the conversation on social media regarding the election of the new pope. As the College of Cardinals gathered in Rome, new Twitter accounts, such as @PapalSmokeStack and @PopeAlarm, were created to closely monitor the conclave’s decision. On the second day of conclave, a seagull that perched atop the Sistine Chapel smoke stack inspired two new Twitter accounts: @PapalSeagull and @SistineSeagull. People around the world embraced modern forms of communication throughout the election of the new pope and published tweets, Facebook updates and other posts across social media following the first appearance of Pope Francis.